Heavy-duty or standard shelves that are manufactured from 22 gauge powder coated steel and designed with support flanges to accommodate normal loads without the need for additional reinforcement. Expansion possibilities — units can be attached side-by-side. Box posts for the front of the unit, allowing full access to the shelf. Performance Plus Clips that secure the shelves to the posts, making the shelving even more stable. Installing and repositioning them is a simple press fit that does not require tools. One inch on vertical centers shelf adjustment, providing ample configuration capabilities. Availability in either open or closed units. ASI Storage Solutions 2 mil powder coat Gray. Other colors are optional. Five shelves standard. Additional shelf configurations available at additional cost. The most basic and economical shelving design for general purpose use. The open backs and sides are stabilized by sway braces. Units include 2 box posts, 2 angle posts, 2 sets of side sway braces, 1 set of back sway braces, 5 shelves and hardware. 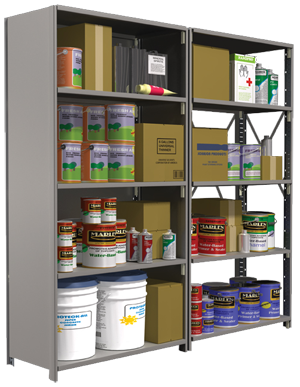 Closed type shelving units improve stability and provide protection to stored items because they are covered on three sides with steel panels. Units contain 2 box posts, 2 angle posts, 2 side panels, 1 back panel, 5 shelves and hardware.